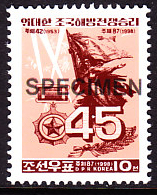 68289 SPE NORTH KOREA (1998) 45th anniversary of victory. Specimen. Scott No 3752, KSC No 3879. 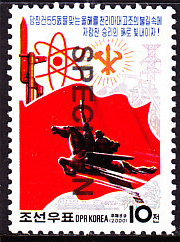 68307 SPE NORTH KOREA (1998) 400th anniversary of Imjin War. Set of 4 specimens (3 stamps + S/S). Scott Nos 3801-4, KSC Nos 3907-10. 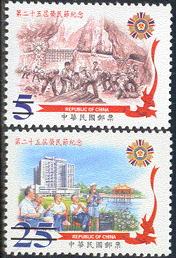 68317 SPE NORTH KOREA (1999) 40th anniversary of worker-peasant Red Guards. Specimen. Scott No 3841, KSC No 3945. 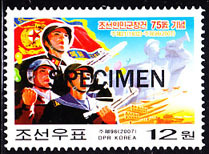 68331 SPE NORTH KOREA (1999) Musan victory. Specimen. Scott No 3862, KSC No 3967. 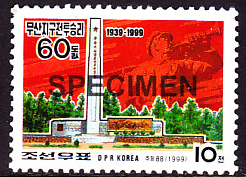 68358 SPE NORTH KOREA (2000) Grand Chollima march. Specimen. Scott No 4033, KSC No 4029. 51949 SPE GERMANY (2001) Association for Disabled War Veterans*. 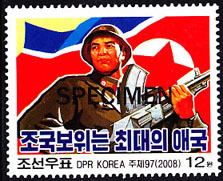 Overprinted MUSTER (specimen). Scott No 2108. 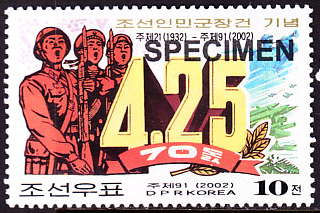 68402 SPE NORTH KOREA (2002) 75th anniversary of KPA. Specimen. Scott No 4214, KSC No 4190. 52626 SPE TAIWAN (2003) Veterans Day*. Set of 2. Scott Nos 3517-8. 71995 SPE NORTH KOREA (2007) Korean soldiers. Mt. Paektu. Specimen. Scott No 4671. 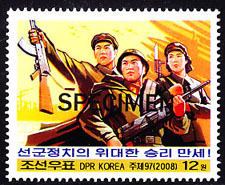 72002 SPE NORTH KOREA (2008) Songun Revolutionary Leadership. Specimen. Scott No 4773. 72004 SPE NORTH KOREA (2008) Soldier. Flag. Specimen. Scott No 4797. 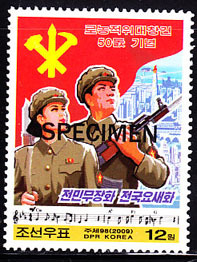 72024 SPE NORTH KOREA (2009) Red Guards 50th anniversary. Specimen. Scott No 4805. 73185 MAX BELGIUM (1955) The Departure Volunteers from Liege by Soubre*. Maximum card with First Day cancel. Scott No 492, Yvert No 971. 73502 MAX HUNGARY (1967) National Guardsman by Borsos. Maximum card with thematic cancel. Scott No 1825, Yvert No 1901. 77561 ENT ROMANIA (1973) "Battle of Smirdan" by Nicolae. 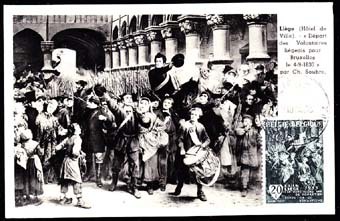 55 bani postal card (N) with corner illustration. 66510 ND HUNGARY (1976) Painting by Szekely*. Imperforate S/S. Scott No 2432. Battle of Mohacs. 60812 MAX LIECHTENSTEIN (1984) Paintings of famous people*. Set of 4 maximum cards. Scott Nos 775-8, Yvert Nos 780-3. 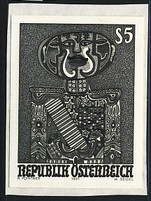 46844 EP AUSTRIA (1984) Imperial troops meeting South Tyrolean reserves*. Black proof. Scott No 1279, Yvert No 1606. 46990 EP AUSTRIA (1991) "The General" by Pointner*. Black proof. Scott No 1551, Yvert No 1873. 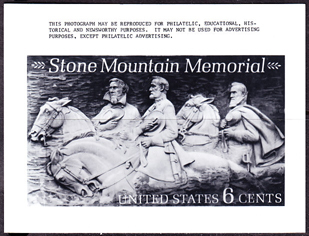 68695 EP U.S.A. (1970) Stone Mountain Memorial. USPS publicity photo essay. Scott No 1408, Yvert No 901. 77506 OBL FRANCE (1952) Army Air School. Cancel on envelope "Les Ecoles de L'Armée de L'Air Donnent un Metier." 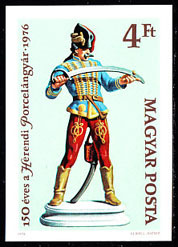 66500 ND HUNGARY (1976) Hussar figurine*. Imperforate. Scott No 2434. Herend china. 49401 SPE MONTSERRAT (1978) Military uniforms*. Set of 4 overprinted SPECIMEN. Scott Nos 393-6, Yvert Nos 394-7. 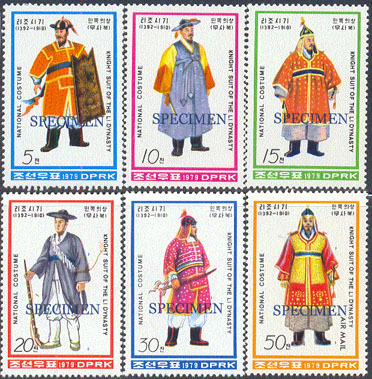 48997 SPE NORTH KOREA (1979) Knights costumes in Ri Dynasty*. 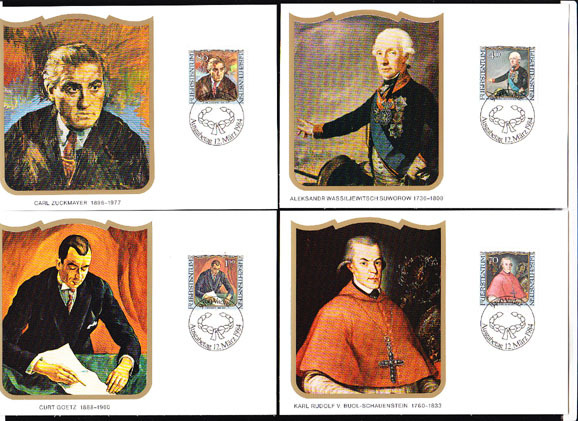 Set of 6 overprinted SPECIMEN. KSC Nos 1848-53. 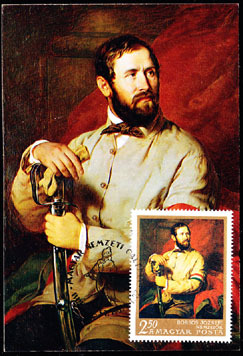 Scott Nos 1844-9. 49103 SPE NORTH KOREA (1990) Warrior costumes*. Set of 4 overprinted SPECIMEN. KSC Nos 2962-5. Scott Nos 2894-7. 54953 SPE JAPAN (1976) Warrior clay burial figure*. MIHON (specimen) overprint. Scott No 1250. 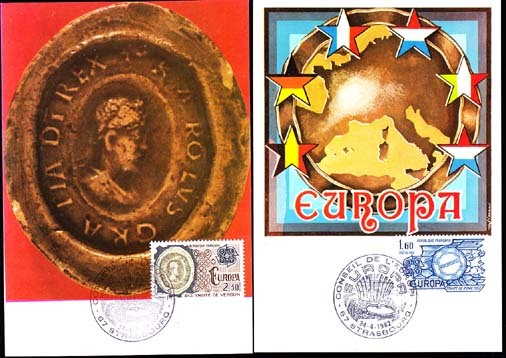 72966 MAX FRANCE (1982) Treaties of Verdun, Rome. Set of 2 maximum cards with thematic cancel. Scott Nos 1827-8, Yvert Nos 2207-8. 28366 EL NIGER (1966) Nigerian flag*. Soldiers*. 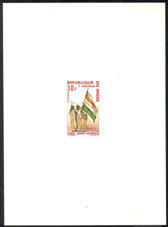 Deluxe sheet, 5th anniversary of National Armed Forces. Scott No 176, Yvert No 182. 77596 EMA FRANCE (1958) Surgery for prisoners of war/combatants. Red meter cancel on envelope "F.N.C.P.G. Association des Combattants Prisonnieres de Guerre - Adherez à sa Mutuelle Medico-Chirurgicale." 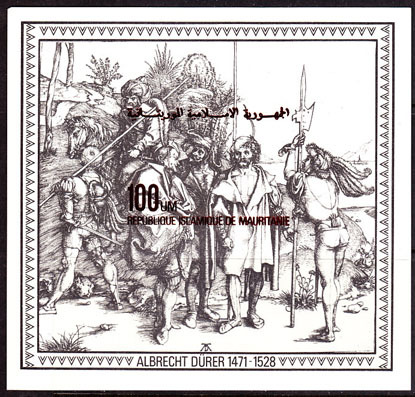 51904 SPE GERMANY (1995) Regensburg 750th*. 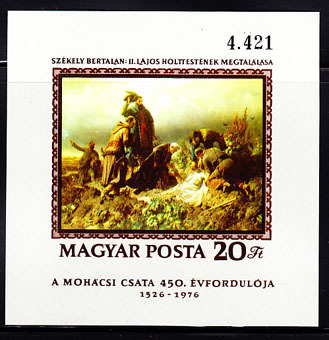 Overprinted MUSTER (specimen). Scott No 1888, Yvert No 1618. 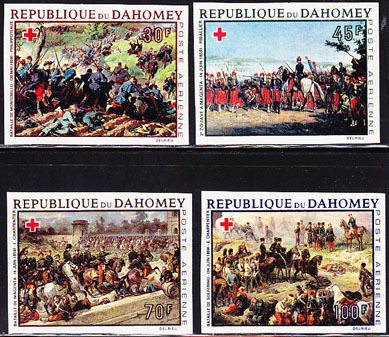 60434 ND DAHOMEY (1968) Paintings of various local battles*. Set of 4 imperforates. Scott Nos C77-80, Yvert Nos PA81-4. 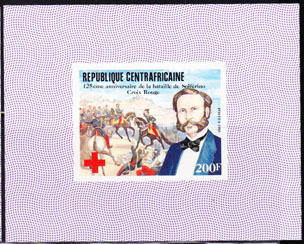 71904 ND CENTRAL AFRICA (1985) Dunant*. Battle of Solferino*. Imperforate. Scott No 725, Yvert No 673. 58367 ND CENTRAL AFRICA (1985) Dunant*. 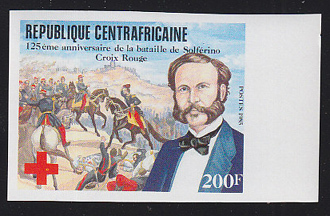 Battle of Solferino*. Imperforate minisheet. Scott No 725, Yvert No 673. 43012 ESS NEW CALEDONIA (1974) French marine aboard ship*. Trial color proof pair. Scott No C116, Yvert No PA156. 35169 SPE JAPAN (1980) Tall ship*. 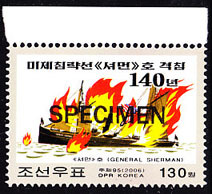 Naval training ship issue overprinted MIHON (specimen). Scott No 1407, Yvert No 1329. 37339 EP AUSTRIA (1973) Hurdler*. Black print. Scott No 946, Yvert No 1247. 23rd Military Pentathlon. 37224 EP AUSTRIA (1964a) "Bringing the News of Victory at Kunersdorf", by Bellotto*. Black print. Scott No 729, Yvert No 993. 15th UPU Congress. 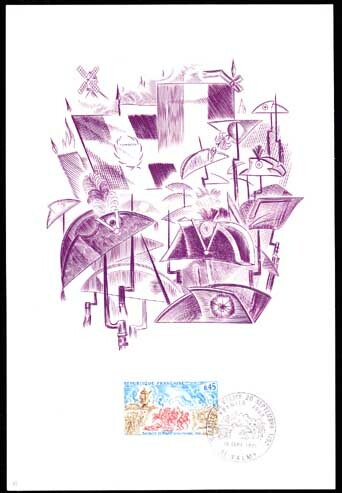 67222 FDC FRANCE (1971) Windmill*. Battle of Valmy*. Philatelic First Day document with special engraving thematically related to the stamp and printed description and explanation of the stamp on the reverse. Scott No 1306, Yvert No 1679. 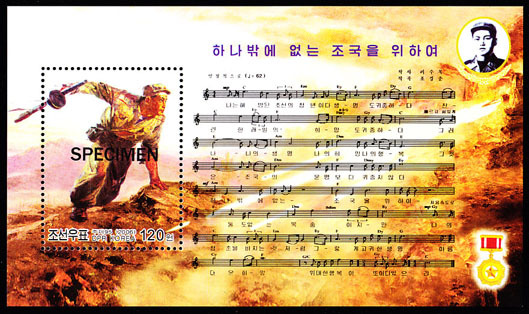 71986 SPE NORTH KOREA (2006) Korean Famous Men (5 generals, a poet and a civil servant). Set of 7 specimens. Scott Nos 4635-41.